Constructing a green wall is like raising a canvas upon which nature has taken care of the art. A stunning, authentic and eye-catching landscape design favourite, green walls and vertical gardens are perfect for home, office, and public settings. Whether inside or outside, green walls and vertical gardens come a variety of shapes and sizes, but always deliver on aesthetic appeal. Whilst most people use the terms ‘green walls’ and ‘vertical gardens’ to refer to the same thing, we’ll make a distinction to help highlight different design possibilities. A green wall is almost entirely, if not completely covered with various forms of greenery, including plants, ivy and moss. Importantly, a green wall must include a growing medium, the most common of which is soil. At Everlast, we have the capacity to erect a green wall with a built in irrigation system. Green walls can be placed in almost any location, and provide fantastic insulation for your home. Vertical gardens, in distinction from green walls, have grown in popularity most particularly in the professional world. 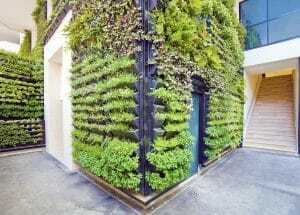 To get an idea of a vertical garden, picture a vertical grid of painted metal bars, somewhat like scaffolding, upon which different sorts of vegetation can be placed. Vertical gardens are designed with clear and cutting aesthetics in mind, and make wonderful office partitions. Australian owned and proud of it, Everlast Services leads in green wall and vertical garden landscaping. Not only is our workmanship of outstanding quality, but we make it our mission at Everlast to offer best-in-class standards of contracting and material, available at an affordable price. In fact, our commitment to keeping costs low without compromising on quality is so strong that we offer the Everlast Services Price Guarantee. You might be wondering just how we can manage this in such a competitive market? Our response is straightforward: we’ve been there and done it for over 20 years. The wealth of experience, expertise, and knowledge we’ve built up over time has allowed us to get a few steps ahead of our competition. But it’s also the case that we’re uniquely placed in the Victorian marketplace. We manufacture our own products and materials at our state-of-the-art manufacturing factory in Hoppers Crossing, Melbourne. So in choosing Everlast Services, you’re not only guaranteed top quality workmanship and material, but you’re also supporting local Australian manufacturing. For all of your landscaping, green wall, vertical garden and manufacturing requirements, we have you covered.